For a new TV program HSI (Dr. Gho) is searching two clients who are willing to let them treat under the eye of a camera. Therefore this two treatments are nearly for free! » are nearly for free! Good find Iron Man. It will be interesting to follow this story, especially verification of donor and recipient regrowth rates. I know some NW6 guys that would like to have some work done, like complete restoration. I had a guy in our consultation today that has received nearly 4000 grafts from this institute in 3 different sessions over the last 2 years. Technically the work was very good, soft hairline, well balanced, no problem. Needles to say it showed signs of missing grafts AND there where NO 3 or 4 hair grafts that we could find. There are patients that have no 4 or 5 hair grafts, but I have yet to see a patient that does not have a single 3 hair graft in his donor. bverotti, I don’t know if you will reply to me now. It seems that you are trying to avoid me. You did it on email, and you have done it in this forum. This is very suspicious. 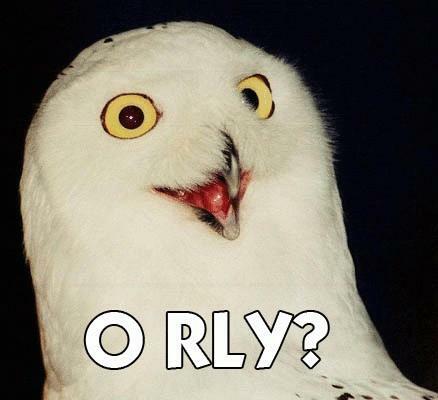 As I am a Gho-sceptical, you should be fond of me, but you are not. I don’t know what is the problem. I am not sure if I have understood your post. -You say that you have seen a former Gho-patient in your clinic. 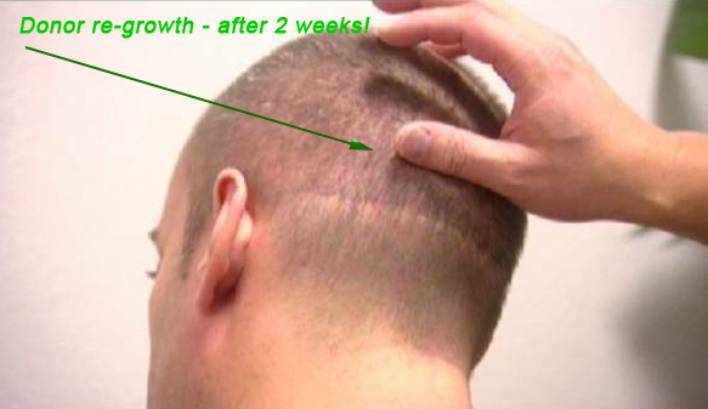 -This patient got 4000 grafts in 3 different sessions, in the last 2 years. -In the donor area, you say there are signs of missing grafts. Could you specify what signs? Are there 4000 white dots? -In the donor, there are no 3-hair grafts, not 4-hair grafts. You say that this is not normal, because all persons have naturally many 3-hair grafts, and possibly 4-hair and 5-hair grafts. But this particular person had none of these. Okay, We know that Gho harvest precisely these multiple-hair grafts. It is shown in the slides of his clinic. He does this supposedly to use the hair fibers as “guidance” for the smaller needle. Okay, what is your theory? -Gho harvested these “3x and 4x grafts”, and afterwards, they were reduced to 1x or 2x grafts. Question: in these grafts, are there white dots? No? Perhaps Gho’s smaller needle produces no white dots? -OR maybe, afterwards, these harvested multiple grafts were totally lost, with no hairs whatsoever? Can you identify where did Gho harvest? Did you find 4000 white dots on the donor? In a previous post (*), you said that you saw a Gho’s patient, treated with the newer technique (HST), and according to you, the donor area looked exactly like in a normal FUE (that is, it had white dots). Does this “4000k-patient”'s donor area look like in an ordinary FUE? We treated an ex Gho patient last week. First let me say that this guy is a a nw6 and received 1600 grafts. Dont ask me why they advised 1600 grafts, we all know that it is a drop in the ocean for a nw6. This patient had been treated early last year, so the ‘new’ technique had been used. We examined the donor area and concluded that no regrowth can be detected in the donor area, just tiny patches of white dots where no hair is growing, just like regular FUE. I am sorry to report that we could not find ANY evidence of HM, cloning or any other kind of hair multiplication. » That is fantastic news. » from this institute in 3 different sessions over the last 2 years. » hair graft in his donor. » I wonder what happened. B) nor growth of transplanted grafts in recipient area! Hmm, maybe that is all in all is just one reason why TV companies are more interested to broadcast HM techniques by e.g. HSI (Dr. Gho) rather than techniques by traditional HT clinics like ProHair? very well, mr. bverotti, considering your attitude, I have no option, but from now on, I will consider your evidence against Gho, NULL. You look no reliable to me. » me, but you are not. I don’t know what is the problem. » Well, I will try anyway. » I am not sure if I have understood your post. » -You say that you have seen a former Gho-patient in your clinic. » specify what signs? Are there 4000 white dots? » fibers as “guidance” for the smaller needle. » Okay, what is your theory? » to 1x or 2x grafts. Question: in these grafts, are there white dots? No? » Perhaps Gho’s smaller needle produces no white dots? » with no hairs whatsoever? » what do you think it happened? » Can you identify where did Gho harvest? » Did you find 4000 white dots on the donor? » exactly like in a normal FUE (that is, it had white dots). » Does this “4000k-patient”'s donor area look like in an ordinary FUE? » We treated an ex Gho patient last week. » ocean for a nw6. » growing, just like regular FUE. » any other kind of hair multiplication. » » That is fantastic news. » » from this institute in 3 different sessions over the last 2 years. » » hair graft in his donor. » » I wonder what happened. Hair Science Institute is since 25 years the specialist in HaarStemcell transplants all over the world. Read here why our HSI technique is unique. Um, really good results? Where? It’s the same old story. They didn’t provide a complete restoration, they didn’t document donor re-growth and they didn’t give any details on the procedure whatsoever. The result this man received could have been provided by any normal FUE doctor. Unless the man in the video comes back for several more procedures and still has enough donor to finish the job, I will remain skeptical. ironman please take a break or may be give US a break!! » ironman please take a break or may be give US a break!! Exactly, all these people who keep going on about regrowing donor hair are really starting to piss me off, they’re bypassing the real problem going round and round in circles because it suits their own interests. Most people find transplants too expensive, we don’t need more ways to make transplants better. What we need is a next generation of treatments that are financially within the reach of the majority of people who are suffering from hair loss, that will give us real results and will be able to bridge the gap to the future of a genetic cure. » to bridge the gap to the future of a genetic cure. » » ironman please take a break or may be give US a break!! » round and round in circles because it suits their own interests. If someone comes up with prove that Gho’s technique is legit… i’d be the first to pay good money for the treatment. However, what annoys me is that no one really cares if he is looking for new clients for some silly TV show to perform a treatment that is not differentiable from FUE, whilst offering no real proof of donor regrowth at all… if he comes up with real evidence proving the legitimacy of his procedure i’ll be interested in reviewing it… until then i too request and end to this endless Gho discussion. » end to this endless Gho discussion. … it’s just up to YOU (e.g. possibility of a test procedure for 500 bucks etc) and other DOCTORS out there, to proof or to disproof Dr. Gho’s (et al) claims – once and for all! IN FACT, Gho’s HST-PROCEDURE IS A COMPLETELY SIMILAR PROCEDURE LIKE A TRADITIONAL FOLLICULAR UNIT EXTRACTION PROCEDURE! 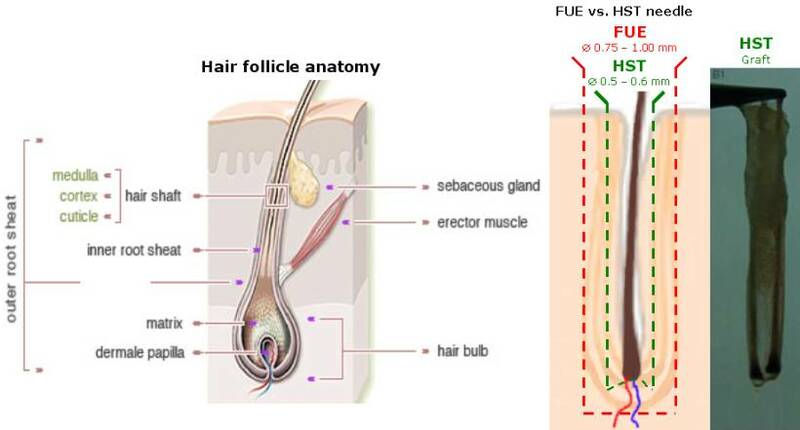 Why did Dr. Gho (et al) headlined this study with “Follicular Unit Extraction” terms? Because the HST procedure IS, indeed, a completely similar procedure as a traditional FUE procedure! 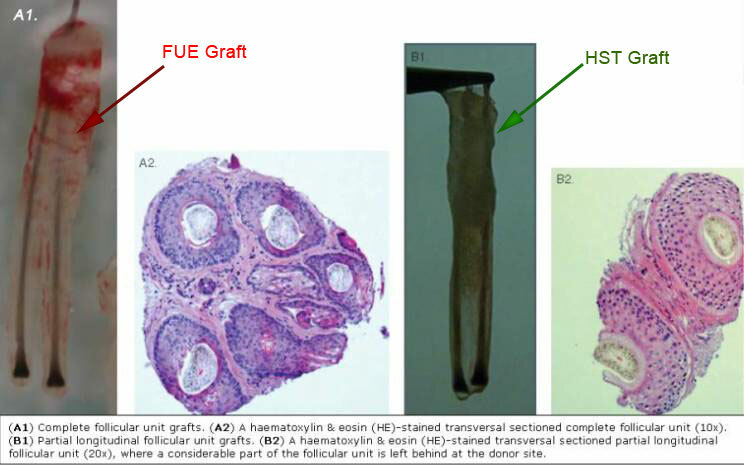 EVERY FUE-doctor out there is easily able to PROOF or to DISPROOF -at least- Dr. Gho’s “donor-re-grow-PART”: they just have to extract some FU’s (e.g. during a scar repair procedure or whatever) with a 0.5 mm punch/needle as described in Dr. Gho’s new study (or pics above) – that’s all. YES, that’s all!! Iron man if Gho can regrow hair, why hasnt he got mile long queues of desperate men waiting to get their hair back? Iron man you are so intrested in Gho why dont you get the treatment done by him, post your pic up on her for all to see? However I grant you that it may now be time for others to disprove his claims rather than for him to provide more proof. Either he is on to something or he is a charlatan who needs to be exposed. Nevertheless posts about more of his non-transparent Gho procedures on dubious TV stars is of no real contribution to the topic. I think a better question is: who gives a sh1t if it works or not? Even if you get donor regrowth it is going to take 50000+ transplanted hairs to “cure” a full on bald man. That is INSANE amounts of time and money, and anyone seriously considering that option should have what’s inside their head examined. JB: 6) Have you considered using traditional FUE at the hairline to fill in non-typical problematic areas experienced with HST or is the consistency of results experienced with HST as good as seen in FUE (I’ve seen some FUE created hairlines that look very good)? 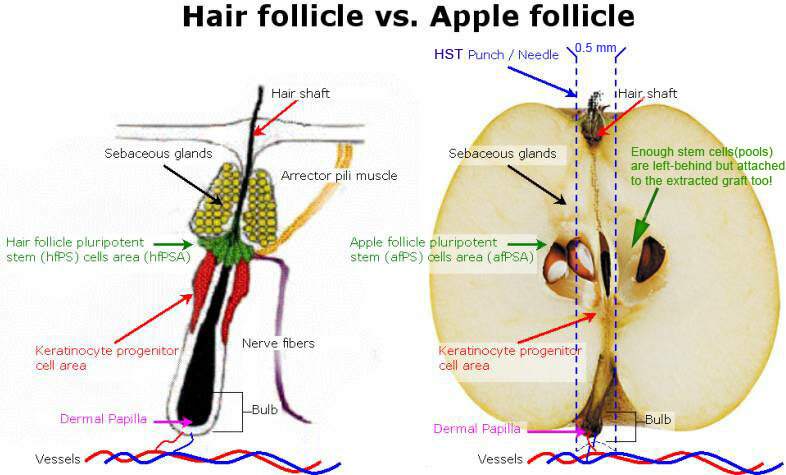 Dr. Gho: Due to the fact that with HST the grafts are smaller, besides the possibility to create a higher density compared to other techniques like FUE, we are able to create a more natural hairline. JB: 7) Your website states that with HST, up to 35 grafts can be placed in a cm^2 in a single session, and up to 50 grafts can be placed in a cm^2 when a second session is performed. Does this mean HST results in a maximum of 50 hairs per cm^2 or do the grafts contain more than one hair per graft. If the latter, then what is the maximum hairs per cm^2 achievable in HST? Dr. Gho: We believe that a natural density is more important than a high density. However, you are right. To create a high density , it is possible to implant 50 grafts per cm 2 Because between 2 to 4 hairs will grow per graft, the maximal density which can be achieved will be around 150cm 2. Of course, in the hairline we will not place these grafts which contain 2 to 4 hairs because this creates a unnatural aspect. 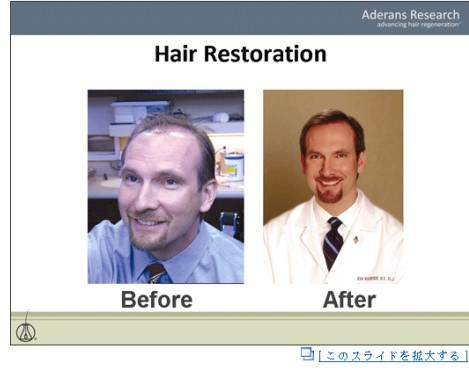 Dr. Gho, 2005: In theory, it is possible to use the same donor area / donor hair follicles again without any limitation. Practically, our main goal is to achieve a natural result. Therefore, it is not necessary to have more than 2 to 3 treatments for the frontal area and 2 to 3 treatments for the crown. » created hairlines that look very good)? » techniques like FUE, we are able to create a more natural hairline. » of 50 hairs per cm^2 or do the grafts contain more than one hair per graft. » If the latter, then what is the maximum hairs per cm^2 achievable in HST? » contain 2 to 4 hairs because this creates a unnatural aspect. Good to hear but if the chance is given for unlimited donor, then i would want to have a full and high density in the frontal area because 2 to 3 procedures are…well very time and money consuming. » procedures are…well very time and money consuming. And traditional HT’s aren’t time and money consuming, besides THE FACT that HT-patients (like e.g. Dr. Ken Washenik) are UNABLE to gain more density and/or to cover up their crown, because the have NO donor reserves left? … has ENOUGH FU’s left in his donor area, after his 1st HST procedure! And THAT makes the REAL difference!